Are you interested in buying a Coop Home Goods pillow, but unsure which one to pick? Want the rundown of their options so you can choose the best one for you? Then we’re here to help. 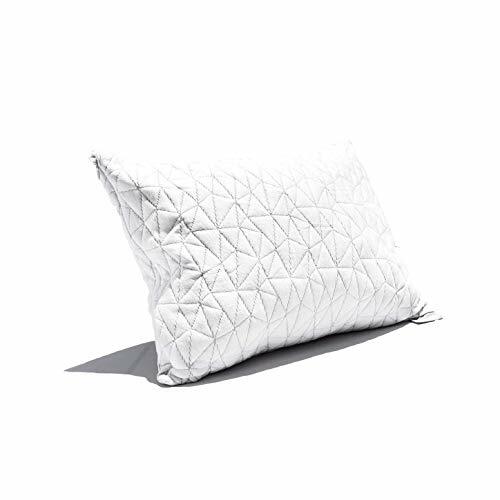 The Coop Home Goods Eden Shredded Memory Foam Pillow uses gel-infused shredded foam to help you stay cool at night. Its environmentally safe foams are CertiPUR-US® certified and may come with an off-gassing odor. Keep in mind that this smell should go away if you keep it in a well-ventilated room for a couple of days. Our favorite Coop Home Goods Pillow is the Eden Shredded Memory Foam Pillow because it is made with cooling gel infused foam and can be adjusted for the perfect level of firmness. Our runner-up pick is the Coop Home Goods Body Pillow, which can provide conforming support for your legs and back in addition to your head. When it comes to sleep health, most people know how important your mattress is, but what about your pillow? While your mattress plays a large role in your sleep health, pillows matter a lot, too. If you’re using an old or worn out pillow, waking up with a sore neck, or folding it in half to get comfortable, it’s time for an upgrade. And even if your pillow is relatively new, you want to make sure you’re using the right type for your needs. 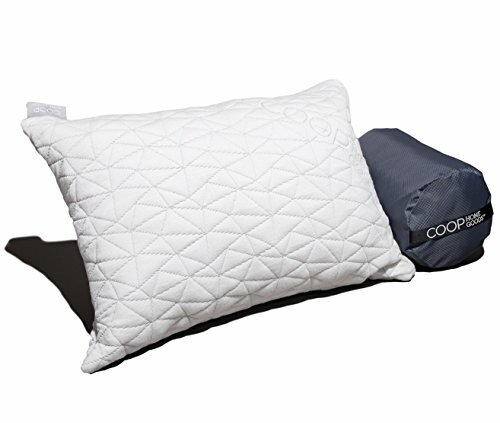 The Coop Home Goods Eden Shredded Memory Foam Pillow uses gel-infused foam to create a cool sleep surface for your head and neck. The hypoallergenic filling is adjustable, so you can add or remove it to create a custom level of firmness. The pillow is designed to provide maximum, edge-to-edge support and is made in the USA. The fabric on the Coop Home Goods Eden pillow is constructed to be breathable and comfortable. The cooling gel foam used in the pillow helps to pull heat from your body and keep you resting at a cool, comfortable temperature. Since the Eden memory foam pillow uses shredded foam, more air can flow through the pillow, also helping to disperse heat. Instead of adjusting to your pillow, you can adjust it to you. The Eden pillow comes with a zippered inner and outer cover, giving you full access to the foam filling. Simply add or remove it until you reach your preferred thickness and firmness. All Coop Home Goods pillows are made right here in the USA with CertiPUR-US® certified foams. This certification tests for harmful levels of toxic chemicals to ensure the pillows are safe for the environment and you. It also shows that the pillows are free from dangerous levels of heavy metals and flame retardants. The memory foam in the Eden pillow is dust mite-resistant and hypoallergenic. If you’re sensitive to allergens and often wake up sneezing, or have a feather allergy, a pillow of this material could be the change you need. If you want to try out this pillow but don’t want to fully commit until you know how it feels, you’ll appreciate the Coop Home Goods Guarantee. This states that if you don’t love your pillow, you can return it and get a refund within 100 days. The Coop Home Goods Shredded Memory Foam Toddler Pillow is a 14 by 19-inch pillow that works well for kids. It’s made from hypoallergenic materials and has a breathable design that will help your child stay cool in the evening. Due to the pillow’s size, it also works well as an adult travel pillow. The Coop Home Goods Toddler Pillow can be adjusted as your child grows to ensure it continues to fit them as they get bigger. This pillow is easy to care for and can be machine washed on cold. Don’t use fabric softener or bleach the pillow, tumble dry on low and always allow the filling to dry out completely before you use it again. This may require a couple of cycles in the tumble dryer and some air drying, depending on the season. 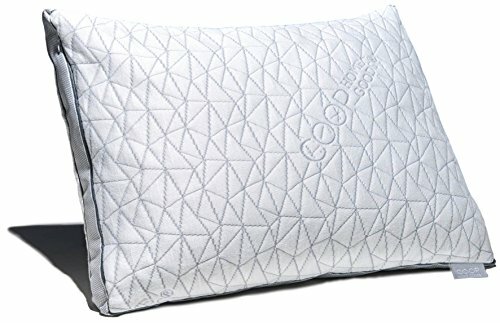 The cover on the Coop Home Goods Shredded Memory Foam Toddler Pillow is made from a 60 percent polyester, 40 percent bamboo-derived rayon material. This fabric is breathable and should help your little one sleep cool. The foam filling in the pillow is CertiPUR-US® certified, which means it’s free from harmful levels of ozone depleters, mercury, and formaldehyde. The Coop Home Goods Toddler Pillow comes with a 100-night sleep trial. If you are dissatisfied with your pillow for any reason, you can return it, no questions asked, within 100 days. The pillow also comes with a five-year warranty. With its supportive filling and breathable cover, the Coop Home Goods Shredded Memory Foam Toddler Pillow is comfortable for children and as a travel pillow for adults. It will easily fit in your duffle bag if you want to bring it in the car or on a plane. Add or remove filling until it’s the perfect height and firmness for you or your child’s preferences. The Coop Home Goods Camping and Travel Pillow measures 19 by 14 inches, which makes it suitable for backpacking or work trips. It arrives vacuum-sealed and flat but fluffs up fast after you unpackage it. The Camping and Travel Pillow by Coop Home Goods has a comfortable filling and a medium level of firmness that should suit most sleepers. However, if you want your pillow to be firmer or softer, just add or remove the filling until you find what you prefer. The Coop Home Goods Camping and Travel Pillow is easy to care for and can be machine washed on cold. Don’t use any fabric softener or bleach when cleaning the pillow as this can cause damage to it. Tumble dry the pillow on low and always make sure the filling is completely dry before using it again. The fabric used on the Camping and Travel Pillow by Coop Home Goods is thermo-regulating, which helps you stay at a comfortable, cool temperature in the night. It has a breathable design that helps you rest comfortably at home or on the road. The Camping and Travel Pillow by Coop Home Goods comes with a cylindrical drawstring bag that makes traveling with it super convenient. To get the pillow into the bag, tightly roll it up at the short end before putting it in the bag. This will help you save space when you bring your pillow on the road. The memory foam in the Camping and Travel Pillow has been CertiPUR-US® certified, meaning it was found to be free from harmful levels of toxic chemicals. The foam is hypoallergenic and dust mite-resistant, so if you suffer from allergies, it could be a good change for you. Whether you sleep on your back, stomach, side, or all three, the Camping and Travel Pillow should work for you as the filling is adjustable. The filling can be added, removed, or molded to your preferences. The Coop Home Goods Camping and Travel Pillow is compact and easy to pack with its 10 by 6-inch size that expands to twice its size. It will conveniently fit into your carry-on baggage, backpack, or car. The hypoallergenic materials are safe for the environment and you. If you notice an off-gassing odor when you order this pillow, just leave it in a well-ventilated room for a couple days until it dissipates. 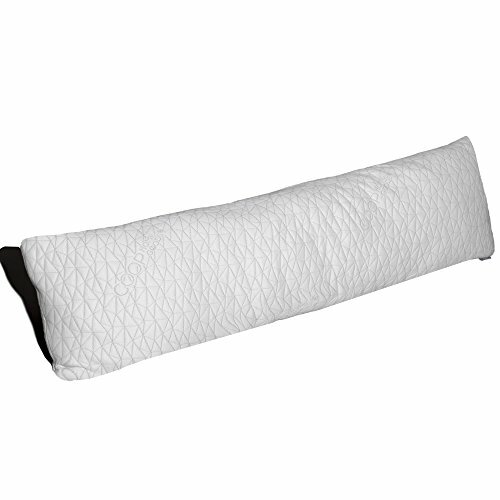 The Adjustable Shredded Memory Foam Body Pillow by Coop Home Goods may be suitable for people with body pain. People with pain issues often require support not just for their neck but the rest of their body. The pillow is heavy and easily stays in place while you rest, so you get the support you need all night long. The Adjustable Shredded Memory Foam Body Pillow by Coop Home Goods can be adjusted to provide you with the feel and firmness you need. Suitable for pregnant women who require some extra support, this pillow should comfortably support back, stomach, side, and combination sleepers. Are you a hot sleeper who struggles with waking up sweaty in the night? This body pillow is made with a soft, washable cover that should help sleepers rest comfortably at night instead of overheating. The bamboo-derived rayon blend cover is breathable and pulls heat from your head and neck, cooling you down while you rest. The Memory Foam Body Pillow by Coop Home Goods has a heavy design that will stay in place as you move around at night. It allows you to sink into it for pressure relief but also provides firm support. This can potentially help people who struggle with pain or tension in their body. This pillow can be machine washed – just make sure you don’t use any bleach or fabric softener on it. Always check to make sure the filling is completely dry before you use it again to prevent mildew. In the winter, this may require a couple of cycles in the dryer. The foam used in the Coop Home Goods Memory Foam Body Pillow is CertiPUR-US® certified. This certification tests the material for harmful levels of toxic chemicals, heavy metals, and formaldehyde. Every Coop Home Goods product is backed by the Coop Home Goods Guarantee. This states that if you don’t love your pillow, you can return it and get a refund within 100 days. If you struggle with body pain and think a memory foam body pillow could help, the Coop Home Goods Memory Foam Body Pillow could be a good option for you. The cover is soft, washable, and cool and the filling can be adjusted until you find the perfect firmness level for you. When products use synthetic materials, such as polyester or memory foam, they’ve been put through chemical processes. If you haven’t used a pillow of this material before, it’s possible you may be sensitive to off-gassing odors and not know it yet. If your pillow has a strong smell when it arrives in the mail, leave it in a well-ventilated room for a few days. For the majority of people, a medium thick pillow will be good enough. If you prefer a thicker or thinner pillow, go with what feels most comfortable for you. Just keep in mind that your pillow should not only feel right but also keep your neck, head, and shoulders in line with your spine. Pillows are often made in special shapes or sizes, such as body pillows, toddler pillows, and more. You’ll find wedge-shaped pillows and tube-shaped pillows, though you should only get a special shape if it’s for a certain need, such as neck pain. Ideally, you’ll already know which size and shape you prefer for your own optimal alignment before you pillow shop. The pillow you select should fit the sleep position you usually use. While there are general guidelines for which pillow type works for what sleep position, these rules aren’t set in stone. Stomach sleepers: If you’re a stomach sleeper, you’ll likely do best with a low-profile pillow or no pillow at all. Too thick of a pillow can cause your head to rest at an unnatural angle, which is bound to cause pain after a while. Side sleepers: Side sleepers may prefer a thicker, firmer pillow to ensure it completely fills the space between their shoulder and ear. This will help their spine remain in a neutral position throughout the night. Back sleepers: Back sleepers may prefer a firm, medium profile pillow to keep their neck and head in alignment. If you’re struggling with body pain, however, you may require something thicker or with a special shape, like a memory foam wedge pillow. Again, it comes down to personal preference and what feels comfortable for you. Your mattress will impact the right pillow choice for you. If you sleep on a firm mattress, a soft pillow may work best for you since it’ll be lying on a harder surface and has to adapt to your head and neck. People with a softer mattress may do better with a firmer pillow to ensure they get the support they need for their neck and head. Most new memory foam products come with a slight scent (called an “off-gassing odor”) that can be compared to a new car smell. This won’t be a problem for most sleepers, as you can keep the pillow in a well-ventilated room to help the smell dissipate. If this doesn’t work, dry the pillow in the dryer for an hour or two to get rid of the smell. If you’re especially sensitive to chemical odors, you might want to do both. Do you need to use an additional pillowcase with your Coop Home Goods pillow? Since Coop Home Goods pillows come with a machine washable, dryer-friendly cover, you can use the pillow as it is without an extra cover. Using an extra cover isn’t necessary and can actually block the pillow’s cooling properties. However, you might want a personalized design on your pillowcase, in which case you can use one. You may have noticed that each of the Coop Home Goods pillows we reviewed above come with a bamboo-derived blend in their covers. Bamboo is a suitable alternative to cotton and can be replenished faster, making it more environmentally friendly. Materials made with bamboo are typically soft and breathable, which is why they’re so popular in pillow covers. Memory foam is sensitive to temperature and will get firmer in cool temperatures (65 degrees Fahrenheit or below). In even colder temperatures (50 degrees Fahrenheit and below), it will feel very firm. If this happens to you, throw your pillow in the dryer and tumble dry it on low heat to warm it up. You can also place it in the sunlight to get it to soften up. In order to adjust your pillow, open the outer cover zipper, then open the inner liner zipper. Next, remove or add filling until you reach the desired amount. Then, close the zipper and redistribute the filling in the pillow by fluffing it up before you use it. Overall, a Coop Home Goods Pillow could be a good option for someone who wants a memory foam pillow with a moldable design. Shredded foam is easier to adjust than solid foam, creating a custom fit, and also promotes airflow for a cool sleeping experience. PrevPreviousAvocado Mattress Review 2019: Could This Organic, Sustainable Mattress be the Solution to Your Back Pain?